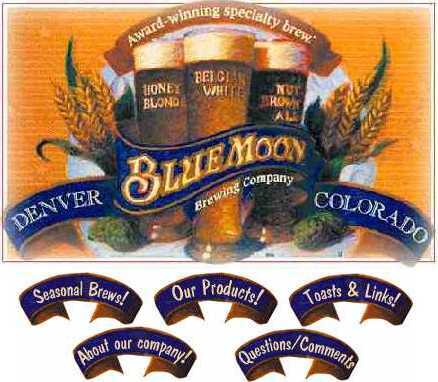 Welcome to Blue Moon Brewing Company's Home Page! At Blue Moon, beer is a Celebration, a daily Reward. We believe in good beer, good company, and unabashed merriment. Blue Moon offers an eclectic line of top fermented specialty brews. Each ale boasts unusual ingredients and flavors designed to distinguish them in the hearts and minds of the growing ranks of microbrew enthusiasts. So surf around here, read up on the hard and fun facts of Blue Moon's handcrafted ales and add a few toasts to your repertoire. There's a saying, "Good beer always finds good company." While we find that to be absolutely true, we also have our own credo, "Good company brings good beer!" So offer a Blue Moon and a toast to your friends, colleagues and loved ones. Revel in each other's company. Enjoy! Our Products | Seasonal Brews | Company Information | Toasts and Links | Questions?